Restore the beauty and function of your smile. The safe, secure, and conservative way to restore a missing tooth. Are you suffering the physical and emotional effects of having a missing tooth? Are you looking for a first-class solution to restore your smile? Dental implants could be the ideal treatment opportunity for you. Trust your smile with Dr. Randy Mitchmore who uses his advanced training and extensive knowledge to transform your smile with modern dental implants. Tooth Root: A titanium post is placed into your jaw to mimic your natural tooth root. This allows for more stability and eliminates the need to remove healthy tooth structure. Abutment: Placed on top of the root, this component is used to secure your custom-made restoration. Dental Restoration: After the implant is secured, a natural-looking restoration is placed on top to restore the function of your tooth. Normally a porcelain crown, the restoration is secured into place and discreetly completes your smile. Dental implants have a 98% success rate and are precisely placed for superior results. This form of restorative dentistry can be used to replace a single missing tooth or multiple missing teeth – using implant-supported dentures. Why choose dental implants in Houston? Click play to learn more about dental implants by Dr. Mitchmore. A simple process with long-lasting results. Dr. Mitchmore always puts the well-being of his patients above anything else. Therefore, he will assess your medical health before recommending any surgical procedure. Next, he’ll use 3-D digital imaging to get a rounded view of your jaw to ensure you have sufficient bone structure to house an implant. We offer mini implants for those with narrow jaw bones. Before placing the implant, our dentist virtually performs the procedure using your 3-D images thus allowing him to see the ideal location for the implant(s). He then uses the digital imagery as a guide during your actual treatment. The first step for dental implants is to insert the biocompatible root into your jaw to create a foundation for your final restoration. Once the jawbone has accepted the artificial root, Dr. Mitchmore places an abutment on top to secure your custom-made dental restoration. The restoration is designed to fit your natural smile so no-one can tell you have had dental implants. Your new tooth is then added and secured into place. We offer IV sedation and local anesthetic during all of our dental implant surgeries. You will feel no pain or discomfort and may even be able to sleep straight through the procedure (remembering nothing!). Our team is with you at all times, will explain each step, and can answer any questions you may have. 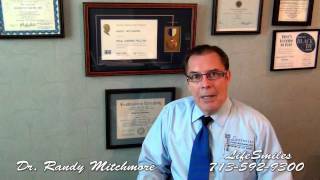 Why Choose Dr. Randy Mitchmore as Your Implant Dentist? With more than 40 years developing his skills and being at the forefront of implant dentistry, Dr. Mitchmore is your number one choice for dental implants. Our Houston dentist has extensive training in dental implants and can also provide IV sedation to make your visit feel like a dream. Discover a modern approach to dental implants in an office equipped with 3-D digital imaging, Pettrau Bridges, and Teeth Tomorrow. LifeSmiles had me won over at the first Hello! I felt so welcomed and comfortable at all my visits. Implant Surgery at LifeSmiles made a scary procedure into a wonderful experience and I was treated very royally. I would recommend LifeSmiles to all friends and family and everyone I meet. A great experience at LifeSmiles! My dentures and implants are great. Thank you, LifeSmiles! Using a stronger material with a natural look and feel. Click play to learn more about Sue’s dental implant experience. If you have had a lifetime of bad teeth, it doesn’t mean you deserve to experience substandard dentistry. On the contrary, at LifeSmiles, we aim to give you the best available care using world-class materials and equipment. With this in mind, Dr. Randy Mitchmore has taken dental implants to the next level by implementing the biocompatible material, Zirconia. This is the strongest dental ceramic material available today and is used to produce exceptional teeth restorations. You’ll experience zero teeth staining or chipping; instead implants that last forever! Achieve your new smile in relaxing surroundings. See our before and afters.